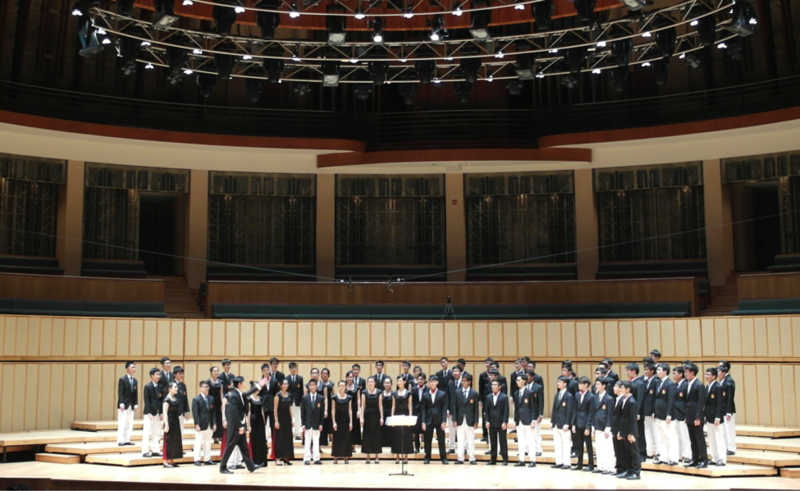 This year’s edition of Raffles’ annual arts festival commenced last Wednesday with the Raffles Choirs performing at a packed Esplanade Concert Hall. In what was a spectacular kick off to Arts Season 2014, the Raffles Choirs comprising Raffles Voices (the Year 1-4 choir) and Raffles Chorale (the Year 5-6 choir) captivated audiences with their highly eclectic repertoire and deliciously sweet singing. It was an evening that saw the audience whirled around in an iridescent vortex that brought them from the solemn, high-ceilinged halls of cathedrals in continental Europe, to the deep south of America with its upbeat tunes and alleluias, all the way to Africa with its kaleidoscope of sounds inspired by animals and the surrounding landscape. 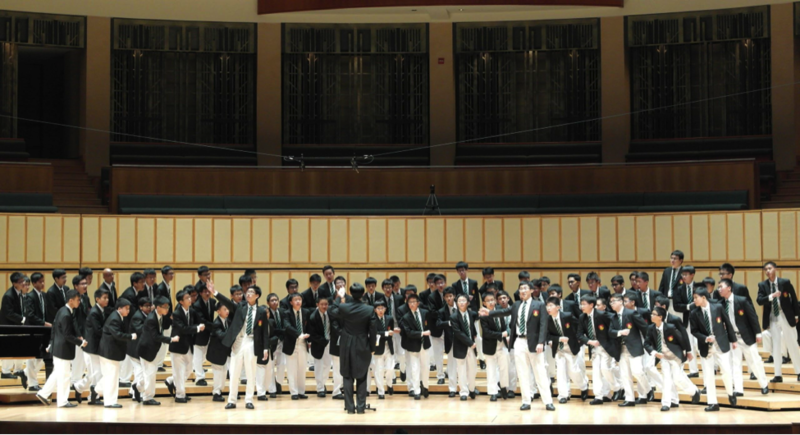 This far-reaching odyssey of music all happened within the inspiring and formidable wooden halls of the Esplanade, its size lending itself in giving the choirs a slight echo and a sense of vastness. Raffles Chorale eased us smoothly into the programme with their haunting rendition of “How Can I Keep From Singing”, arranged by their conductor, Mr Toh Ban Sheng. It was an apt song to begin the programme– a hymn which exults so greatly in the presence of God it cannot help but express itself in song. True to style, Raffles Chorale made an impressive entrance. As the lights dimmed and the scattered glow of cellphones subsided, Chorale left us in a palpable darkness for some time, before the calm and honeyed voices of Daphne Quek and Ma Yuqing cut through. Light slowly began to fall on the stage as the sweet singular voice was joined by another, and yet another, gradually forming a powerful but austere chorus reverberating around the theater. As the light grew stronger on the stage, figures could be discerned walking deliberately and purposefully to centre stage, and when they came on in full brightness, the entirety of Raffles Chorale was before us. Masterfully using a technique called chance singing, in which each singer takes a chance at their own tempo, the song was multi-layered, with different waves of sound moving against and along each other that convalesced in a glowing whole. Needless to say, the audience was entirely dazzled. After a brief rearrangement of singers, they dove straight into their second piece, Josef Rheinberger’s “Abenlied”, a post-resurrection story about the light of Christ. If their first piece was like numerous rays of light melding together into a continuous whole, then their second piece was like waves crashing on rocks. What shone through were the deep and mellow tenors and bases, offering a rich contrast and foundation for the higher melodies that were superimposed on top of it. The song was memorable for its elegant and brilliant close: it ended on a brief but candid descent, as if down a flight of stairs, to reach a soft but solid and resounding note. One of the night’s highlights was their third and fourth pieces. Departing from the angelic aura of the previous two songs but nevertheless keeping to a semi-religious theme, Raffles Chorale indulged us in their energetic and passionate delivery of Z. Randall Stroope’s “The Conversation of Saul”. In the Bible, Saul was someone who initially persecuted Christians but was eventually turned over and became one of Christianity’s forward and belletristic writers. Beginning with a driving, pulsing chant from the boys that was constantly returned to throughout the song, the girls slowly joined in with their own refrains that complemented but did not mimic the boys’. Immediately, we felt a tingling sensation in our spines; the music seeped into our bones. Violent but coordinated feet stamping was weaved into the song, imitating thunder. It was seemingly frenetic but beneath the apparent chaos was a very controlled and skillful execution of music. Towards the denouement, we began to hear crazy descending chromatic scales, giving the effect of something spiralling out of control. It was the most exciting piece of the evening. From this terrifying and gripping piece, we were immediately catapulted into the realm of the stars: next on their repertoire was Audrey Snyder’s “And In The Evening”. Based on William Blake’s poetry, it was a song that promised to juxtapose the mystical nature of dreams with a wide field of stars, and it did not disappoint. Notably, the choir distributed wine glasses filled with water to varying levels during the emcee’s introduction. The song was largely amorphous and ethereal, flowing in a certain direction but seemingly flowing everywhere as well. Indeed, we were brought up and down as if a sloping mountain range and from the weirdness of dreams to the terrible vastness of a star-filled night sky. The choristers slid their fingers over the rims of the glasses, producing a discordant but spectral sound that seemed to echo around the concert theater. Shayna Yap accompanied on the piano and played solid chords that, in tandem with the contrastingly eerie sound of the water glasses, gave the song a sonorous feel. With that, Raffles Chorale concluded their first set and gave the stage to Raffles Voices. Where Chorale was more timid and had sharper and more powerful high notes, Voices delivered their characteristic and entertaining theatrics. They were generally more lighthearted, even if they appeared more nervous when arranging their blazers and being asked to shuffle about on stage into position. Having been brought across continental Europe by Chorale, Voices took us into the heart of Africa with Audrey Snyder’s Amani, which means “peace” in Swahili. Although accompanied by slightly awkward posing and marching, the upbeat and cheerful tune along with the rhythmic beating of percussion African drums had the audience’s feet tapping to the music. We then had David Dickau’s “If Music Be The Food of Love” (a reference to Shakespeare’s ‘Twelfth Night’), a piece similar to the first in terms of its need to express its joys in music, then “J’entends Le Moulin” by Donald Patriquin, an equally mesmerizing song because of its usage of various sound onomatopoeic sound effects to conjure a colourful soundscape. Cheng Xin Yu and Guan Xin gave accompaniment on the percussion, and Gavin Jared Bala gave an astounding and instructive performance on the piano, at times even surpassing the choir. With that, they yielded the stage once again to Chorale. Raffles Voice treated us to another two songs, “Northern Light” by Ola Gjeilo, which melancholic notes reflected the mysterious beauty of the aurora borealis, and Oscar Galian’s “Salseo”, where the swingy and rhythmic tune along with the trademark Spanish lyrics provided great entertainment. Then, the combined choir came on stage to give us the world premier of “Tui Sunt Coeli” by Vytautas Miskinis, a song that blended a whole smorgasbord of tunes to one continuous whole, as well as the iconic and easily recognized “Baba Yetu”, or the Swahili Lord’s Prayer, noted by many to be Civ-4’s theme song. The soulful and melodic piece had distinct African roots and Marc Leong and Jonathan Tan delivered riveting performances as the piece’s two solos and enthralled audiences with their mellifluous but powerful voices. Even as we sat at the back of the first floor, we could feel the vibrations from their singing. It was, as Zhang Yimin of 15S03H said , “so beautiful that it was disconcerting”. As the evening drew to a close, and amidst fanatic cries of “encore!”, the combined choirs departed somewhat from tradition and delivered another piece, Stephen Paulus’ “The Road Home” before performing the much more expected and customary school song. Even a parent we overheard was somewhat surprised by this encore, as were the most of us. This piece was a pleasant surprise with a much simpler arrangement than most of the complex multi-layered repertoire, yet held its own rustic charm. The evening finished of course with the institution anthem, at which tentative Rafflesians glanced around nervously at the hall to see if they should stand up. After one or two did, however, all the students in the Esplanade stood up at attention. The choirs’ rendition of the school song is always something to look forward to, a refreshing change from the dreary and somewhat gaudy version played on not-so-adequate speakers at morning assembly. The ending, with its delayed last line, is always a delight, where the song reaches an entire octave higher than it normally would. The sound was sublime and we surrendered readily to the familiar melody. In those four stanzas, singing the school song in front of the rest of the audience, you could definitely feel proud to be a Rafflesian. In fact, in class, it is not unusual to find her quietly but delightfully humming some of her favourite tunes from their repertoire. That the performance went so smoothly that the evening flew by is testament to the combined choirs’ dedication to making good music (and the implied hours that this dedication demands) and putting on a hell of a show. No mean feat considering that their pieces were scattered in terms of style and mood as well. Explaining the eclecticism and diversity of their song selections (and a possible religious undertone), Mr Toh said “the repertoire usually consists of songs that we programme for participation in international festivals we are taking part in. For Chorale, it is taking part in a Musica Sacra International Festival in Czech Republic. To fulfil the requirements of the 2 categories we taking part in and the grand prix, it resulted in a predominantly sacred music programme this year. Nonetheless, I try to find music that embodies contrasting characteristics and yet appeals to the singers. It’s always a challenging task.” He explained similarly that Raffles Voices travels in December and thus has little room to programme in something more than the competition repertoire. Hence, they performed an African song of peace, a lush modern American work, a virtuosic French folk arrangement, a modern sacred Latin piece, and an onomatopoeic Salsa piece. 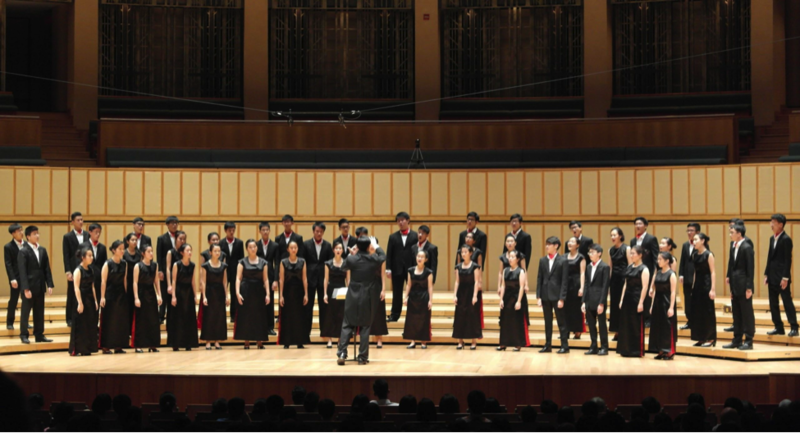 Raffles Chorale charmed the audience with its ability to blend seamlessly complementing layers of music into a harmonious web; once the audience was caught, they were never let go. While Raffles Voices was not as technically brilliant as their senior counterparts, their characteristic passion more than made up for it. Their spirited and theatrical renditions of songs were infectious and kept audiences glowing long after they left the stage. Limelight 2014 was a real pleasure and set a high standard for Arts Season: both choirs put on show-stopping performances and kept audiences spellbound for the entire evening. The whirlwind ride from one region of the world to another was pulled off deftly and convincingly despite the difficulties of this monumental task. Both choirs handled the repertoire expertly and highlighted innocent nuances in their performance and, for two brief hours, sang the devils out of the details, bringing us away from the Esplanade and onto a breathtaking journey of music.